An unprecedented show of force from America’s leading economists! 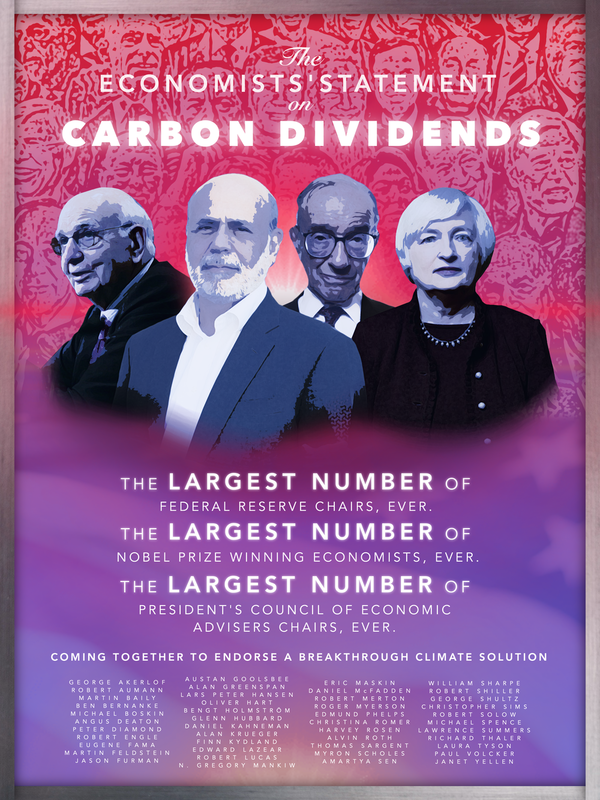 Unveiled on Jan 17th, 2019, the "Economists' Statement on Carbon Dividends" represents the largest expression of combined economic expertise in American history. The statement is signed by all living former Fed Chairs, 15 former Chairs of the Council of Economic Advisors (CEA), and 27 Nobel Prize-winning economists—the largest number in each category to ever sign a joint statement. Notably, this includes EVERY living Republican CEA Chair (stretching all the way back to President Gerald Ford). There has never been a statement of this kind in American history.